It’s 1756 and the Saxon Army is blockaded in Pirna by Frederick II of Prussia. 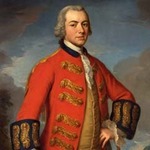 Learning that an Austrian army under Field-Marshal Browne is marching to their relief, Frederick leaves sufficient troops to maintain his blockade and marches south to intercept Browne. 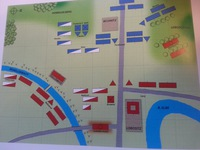 The armies meet at Lobositz. Yes, despite the heading, it's the Lobositz scenario. I’ve played all of the scenarios in the HoW rules but not Lobositz because I didn’t have enough units. But I had forgotten how flexible HoW is for different scales. Stupid really because I play with 10mm miniatures, my standard units are 32 figure infantry battalions & 12 figure cavalry regiments and I use "15mm scale” game distances - exactly as outlined on Page 8 of the rule book! All of my units are 4 bases strong and the reason I use 15mm game distances is that all of my units share the same frontage of 4 inches (10cm) for that scale. So, there was the answer. Reduce unit sizes and frontages to 3 bases and 3 inches (7.5cm) respectively and use the actual “10mm scale” gaming distances in the book. Then, with the spare bases, make up the rest of the units required for the scenario. The game was on. This is how the initial set up in the book was represented on the table. The Elbe is impassable, the Morrellenbach is fordable and the Lobosch is the only steep hill. The cotton wool in the first table view represents the swirling mist that interfered with visibility for firing and charging during the first 3 moves. 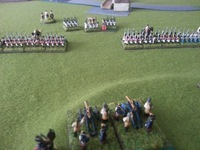 The second table view is from behind the Prussian line. If I've done this right, hopefully all you have to do is click on the thumbnails. Army Break Point for each side is 10 enemy units. With the weight of their infantry on the left flank and Lobositz worth two Army Break Points if taken, the Prussian plan was simple - take Lobositz. The Austrian plan was also simple - hold Lobositz while the Left Wing swung round to the rescue. The AAR will follow as soon as possible. Hoping to take advantage of the poor visibility, Ferdinand’s brigade probes forward but the mist temporarily clears and Austrian guns and musketry maul his 2 leading battalions. Prussian cavalry in the centre is also forced to retire. So far, the mist seems to favour the Austrians, clearing to let them fire on the Prussians every time they advance, then swirling back when the Prussians wish to! Meanwhile, the Austrian left wing cavalry cross the Morrellenbach. Von Kleist’s Prussian infantry brigade moves up as the Prussian line attempts to form for the attack but the terrain forces the lines to bunch up giving the Austrian artillery a very tempting target! When the mist clears, Browne orders Kollowrat’s infantry on the Left to ford the Morrellenbach. His Left Wing cavalry however are attacked by Gessler’s Prussian cavalry brigade and Lowenstein’s Kurassiers are pushed back into the stream. Although meeting stubborn resistance from the Grenzers, the Prussian Left Wing attack appears to be working well when a Hungarian battalion is routed and adjacent artillery crews fall back abandoning their guns. However, 2 Prussian battalions are also driven back and, in so doing, burst through 2 battalions of von Kleist’s following-up brigade which also suffer hits from grazing fire. To avoid the devastating Austrian gunnery, another Prussian battalion presses on in the centre, only to be charged by Radicati’s Austrian cavalry. Kyau’s Prussian cavalry ride to the rescue and in the ensuing fight, the infantry, a Prussian Dragoon and an Austrian Kurassier regt. are Done For and another Austrian unit retreats. Prussian success continues as their heavy guns cause yet another Austrian artillery battery to abandon its guns and Kyau’s Kurassiers drive an Austrian Dragoon regt. from the field. But then Prussian fortunes appear to change. Bevern’s attack crumbles when the Grenzers rout 2 of his fragile battalions, a Prussian battery falls to Austrian Hussars and the Austrian gunners scramble back and retrieve their guns! Immediate retaliation follows. Radicati’s Austrian brigade evaporates when his last Kurassier regt. is finished off by the Prussian heavy guns and his hussars are routed by Kyau’s Kurassiers! However, Radicati’s sacrifice is not in vain and Kollowrat’s infantry are almost in position over the Morrellenbach. Excellent looking gaming table and your 10s look superb. Kollowrat’s Austrian infantry are now over the Morrellenbach and form a new line from Lobositz to Sullowitz. 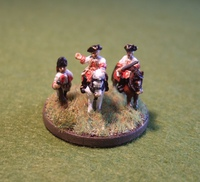 Flank support is provided by Lowenstein who commands Austria’s only remaining cavalry brigade. The Prussians reform to meet this threat. Another heavy cannonade and, once again, Lowenstein is driven back over the Morrellenbach. Seeing the exposed left flank of the Austrian infantry, Gessler decides to charge whilst the Austrian cavalry are forced to reform - a risky adventure against steady infantry - but which might pay off if God is with him. Well, God was not and although he forces one Austrian battalion to retire to Sullowitz, one of his Kurassier regts. routs in the process! On the other flank, whilst the Austrians run another battery forward to form a grand battery on the Wchinitz-Lobositz road, the Grenzers attack but falter in the face of Prussian musketry and canister. While these take refuge in Lobositz, the Austrian guns continue to bombard the Prussian centre which holds despite one battalion falling back to reform. In the failing light, the Austrian Left continues its relentless advance towards the Homolka Berg. In desperation, von Kleist’s Prussian infantry mounts an audacious attack in an attempt to punch through to Lobositz. But the attack falters as combined fire from guns and infantry routs one of his battalions and forces two of Ferdinand’s back. 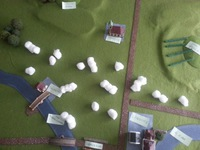 For their part, the Austrians also lose one battalion which is blown away by Moller’s heavy guns. Catastrophe. Bad luck affects the Prussian attack. In the face of the Austrian grand battery, the remnants of von Kleist’s brigade stand like rabbits caught in headlights. 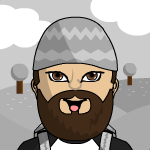 Austria wins the fire initiative roll and it’s “Goodnight, Vienna” for the two battalions. Despite Moller sending another Austrian battalion into retreat, it was “game over” for Prussia. Technically, Prussia was still in the game having sustained 9.5 Army Break Points but, as Austria’s tally was only 5.5 at this stage and the Prussians were nowhere near seizing Lobositz (plus, the dining room table was required for …. err … dining), Prussia conceded victory to Field-Marshall Browne. Great to read your posts westmarcher. It's always rewarding to see a book scenario giving someone a pleasurable game. Although I don't understand your dice (no 4 on the red dice for example), it's a very nice report. Clearly written with plenty of photos. Thanks for sharing! And always nice to see victory going to the Austrians. Thanks to all for your kind words - having seen your own work and reports in the past, that is praise indeed! Jon, I've stalked your blog for some years now and Steve, do you also comment/write reviews on TripAdvisor? And guess what, Keith, I like your rules (after swearing I would never buy them - "I don't need yet another set of rules" - thank/blame Leman for that)! And, damnitz - well, if the Austrians had won, what would have been the name of the battle? (probably still Lobositz!). Turning to the dice question, the absence of "4" on the red dice is down to the timing of the photographs. 1. Those with a 5 or 6 are "Done For" units which I left on the table for visual effect. Keith actually mentions doing something like this in his rules. After their photographs were taken, they were removed from the table. I changed the dice to red and left the score on so that I would not forget to remove the unit after all of the photographs for that turn had been taken. 2. As you will have guessed, the other units with red dice represent units that sustained 4 hits in the firing or melee phases and retreated up to two moves back. The reason a score of "4" is not shown on the dice is that the photographs were taken at the end of the Rally Phase of the turn. If you have just 2 or 3 hits the colour is still green. You change from green to red if you get 4 hits. If you have 2 or 3 hits you can go on as before. However I prefer to pull back units with 3 hits to rally off at least one hit (because you get the -1 modifier with 3 hits recorded). Sometimes you have to use units with 3 hits just because you have no alternative. Not me on Tripadvisor, as to the best of my knowledge, I've never posted anything. If you have just 2 or 3 hits the colour is still green. You change from green to red if you get 4 hits. If you have 2 or 3 hits you can go on as before. Yes, I know. Perhaps I misunderstood you or did not clearly explain why there was no "4" on the red hit marker dice. The units had green hit marker dice. When the hits reached 4, the units retreated. The green hit marker dice were changed to red. stevej - Who is this imposter on TripAdvisor then? Do you know he is leading the high life using your name? OK, than we Play it differently. Units with red dice stay stationary and can rally off hits in the rally phase (to 2 or 3 hits). Than they get green dice again. That gives the attacker the chance to avoid the defender rallying off hits by just advancing near enough. Other way round it does not make sense to me that it is mentioned in the book, that a unit which still has 4 hits after the rally phase has to retreat again. Each to their own. It's only a game and you are free to apply your own 'house' rules - the 'Rules Police' will not be knocking on your door! Units that have retreated with 4 hits and a loss of morale need to reform before they can continue in the game. Change their hit marker die to red to indicate this. These units rally off hits as normal. If they manage to rally off less than 4 hits in their first rally phase, they will spend the next turn reforming. 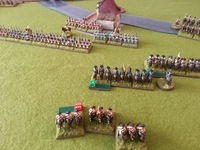 As I highlighted earlier, the rules states that retreat is made after all firing for the turn is complete. The next phase is the Melee Phase and the next one after that is the Rally Phase. This is the unit's first rally phase. We both agree that units with red dice next turn must remain stationary to reform. With your 'house rule' it will take longer to rally off hits. Great looking game Westie, but I’m totally stumped by the red and green dice controversy. As far as I can tell from the rules 4 hits is a red dice and a retreat. End of turn attempt to rally off hits, but remain red to reform during next move. Dice returns to green at end of that following move. As far as I can tell this is what you and I both do. Anyway, I played that scenario as Prussia and was utterly trounced.